So, are pit bulls dangerous? Jason Mann from PitBullLovers.com addresses this question and others about this fascinating breed in the following interview. Few know as much about this breed as Jason, and his love for them shines through in this interview, as does the content on his fine website. Q. 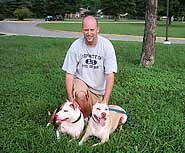 Thanks for sharing your time with us today Jason, your website is such a great resource on American Pit Bull Terriers! Could you tell us a bit about yourself, and what motivated you to take such an interest in this particular breed? A. I have always been a dog lover. A friend of mine fell upon hard times and asked if I would dog-sit his American Pit Bull Terrier for a while. His dog's name was, Puppy. While the name was not that original, Puppy was one of a kind. After 3 months with Puppy I started researching the breed and found myself devouring anything "pit bull." After my friend picked Puppy up, I was searching online for some information and came across a breeder’s website. There I saw a picture of this little Pit Bull Terrier running. I was smitten from the get go. Puppy lust got the better of me and I called the breeder and inquired about the puppy. Luck was on my side, as a man had already put a deposit on the puppy but could not get her because he was not going to be stationed back here in the U.S. for some time. Long story short, after some difficulty getting her shipped here, Angel arrived on a cold January night in 2000. From that point I started researching more. Talking with owners, learning about training, handling, diets, and exercise. I talked to hundreds of breeders and owners and then I found out about the terrible situation Pit Bulls are in. Rescue became my second language. I ended up with another dog, Honey, who my roommate at the time had purchased from a backyard breeder. Honey is my on-going head case. A. Their ability to continue to love people even after horrible abuse. Like being set on fire, beaten nearly to death, and starved. B. Their personality, they are never say quit canine athletes, and that appeals to me. I have learned so much from watching American Pit Bull Terriers work all day and play all day just for a scratch on the head and a nice treat. Their drive to please is the most impressive aspect of this breed for me. Q. For anyone considering this specific breed as a pet, what are the most important things they should know about living with and raising American Pit Bull Terriers (such as certain health concerns for the breed)? A. The most important thing is these dogs are not lap dogs. Though some of them will think this way. 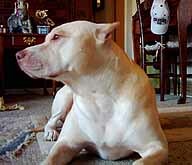 American Pit Bull Terriers need exercise, they thrive on hard play, and they do best on a raw or grain-free diet. Training is mandatory for the breed. Training allows these dogs to exercise both mentally and physically and this goes a long way towards nipping any future behavior issues in the bud. Positive reinforcement works best in my experience and I have been training Pit Bull Terriers and related breeds for going on 10 years now. I have not found a more effective approach. When you consider an American Pit Bull Terrier for your home you should remember they are, on average, high energy intelligent canine's that must have positive stimulating experiences. While socialization is critical, it does not guarantee your dog will be dog friendly as an adult. These dogs were and still are bred for animal aggression with a focus on other dogs. Q. Are there standard characteristics of the American Pit Bull Terrier that make them stand out from other breeds? A. This one is easy. Their undying loyalty. I have not found a breed of dog to date (and I am a professional dog trainer) who has the same tenacity for love than the American Pit Bull Terrier. Though I'm sure folks who fancy other breeds would argue that. The American Pit Bull Terrier's ability to take a lickin' and keep on tickin' to borrow the Timex watch tag line, is unlike any other breed out there. Hardy, athletic super canines, American Pit Bull Terriers are without a doubt, the top canine athlete in the world today. American Pit Bull Terriers excel at just about anything you ask of them. From protection sports, to finding lost kids, to searching for survivors of the Space shuttle Columbia, to helping the elderly feel less alone, to finding drugs and bombs in Washington State as patrol K9's, these dogs can do it all. Q. What do you think has been the most significant reason in causing the negative stereotypes of Pit Bulls as fighting animals, to be perpetuated? And are pit bulls dangerous? A. Owners themselves are the most significant reason. I believe "bad dogs" are rare. However, I believe bad owners are plentiful. Stereotypes are not stereotypes for no reason. They are based on a little truth. Yes, Pit Bull Terriers attract owners who lack moral character. This is not to say all Pit Bull owners lack moral character. People want a tough dog. Some use them to make money in the fighting ring. Others, use the dogs for status, and basically do not have a honorable bone in their body. This helps to perpetuate the stereotype that these dogs are "only good for fighting" to quote one "dogman." As I mentioned earlier, these dogs are much more than that. Dog fighting is illegal, immoral, and anyone who puts a dog in a pit to fight another dog (or any animal) lacks honor. They let their dogs do the fighting and dying while they pretend it’s all in their best interest. This is ridiculous. There is no place for such an activity in a modern society. Based on a few rotten apples, people burn down the orchard. Through my web site at PitBullLovers.com I have met thousands of responsible Pit Bull owners who want only to live a peaceful life with their dogs. Unfortunately there are people out there who are making it their life's mission to stop us from living that peaceful life. Q. If someone is interested in finding an American Pit Bull Terrier as a pet, where should they begin looking? How can they ensure they find a gentle, caring pet? A. This really depends. If you are a first time Pit Bull owner I suggest finding a Pit Bull specific rescue organization and purchasing an adult dog. You will save yourself a ton of headache going this route because the dog is already "set" in regards to their personality and temperament. You will know the dog is either good or not good with dogs and other animals. The dog is going to be neutered or spayed already and the rescue may have already started basic obedience training with the dog. Going this route not only gives a good dog a home, but you can learn more about the breed before diving head first with raising a puppy. However, if you want to buy a puppy (most rescues have puppies too), then I would suggest taking 12 months or so to research breeders, meeting the breeders, asking them questions about the parents, grandparents, why they breed, if you can get references, if you can meet their dogs and see their kennel's, just to start. Bottom line is don't just jump in and get a puppy "because he was sooooooo cute." Buying a dog from a rescue or a breeder, is not something you should take lightly. It is a 12-16 year commitment. One that you cannot shuck off to someone else if things don't work out. Make sure you have a stable home situation, there are no Pit Bull bans in your state/city/town, and you have the income to support the dog. The average dog costs $1200-$1500 per year in food, medical bills, training and other areas like toys, boarding etc... Now add the $500-$2000 price tag to that. If you can't comfortably afford that, don't buy an American Pit Bull Terrier. Q. How did you begin developing ideas for training Pit Bulls? Do you have a background related to training Pit Bulls, or is this a hobby you picked up through care of your own animals? A. I started by training my own dogs, after that I fell in love with training. I was hooked. Just like my passion for the breed, I found a real passion for dog training. I started my dog training business 3 1/2 years ago. While I had been training dogs with a focus on Pit Bulls for 7 years before that, I didn't feel like I was ready for the big time so to speak. One day I decided it was high time to find another job. Dog training obviously won out. I started training Pit Bulls for one reason. It saves lives. Pit Bulls are, as I have said multiple times throughout this interview, canine athletes. They are high energy work horses that need to redirect their drives into positive things or they can become destructive. Pit Bulls without training are far more likely to end up in a shelter than Pit Bulls whose owners have sought out training. My training methods are a combination of methods I have learned from trainers I encounter. I take a bit from this one and that one and then I apply it to my training programs. My ideas for training Pit Bulls are not unique but they do differ because we focus more on the dog’s personality rather than a cookie cutter "this is how it's done my friend" method. Pit Bulls have lots of "spirit" my ideas use that spirit and direct it into training that results in a sharp, well behaved canine companion. Q. Would you mind sharing with us what your most important training tips are for Pit Bulls? 1. Hire a professional. Get someone who uses positive motivational methods and get involved with them. Pit Bulls do not need harsh training methods to excel. They need leadership and guidance. 2. I think the first behavior a dog should learn is to come when called. While "sit" and "down" are important, calling your dog is the most important thing you will ever teach them. Get focused on that and train it. 3. Build play into training. Pit Bulls love games. They love to engage their owners and they desire attention. Playing while training is the most effective way to teach a Pit Bull obedience. This also breaks up stress and allows them to "shake off" anxiety that results from training. Q. Tell us more about your manual on how to train American Pit Bull Terriers, and why someone should purchase this manual? A. My e-book, The Pit Bull Training Handbook is devoted to teaching positive, motivational methods to Pit Bull owners to help them raise a friendly, well mannered, Pit Bull. If you are looking for a manual that is not a cookie cutter book, The Pit Bull Training Handbook is that manual. The book focuses on using the specific Pit Bull traits to help them learn obedience. For example, how to take their gripping instinct and use that in training. This is something you won't find in some Barnes-n-Noble book. Along with the e-book comes a community of Pit Bull owners. It comes as a bonus and people can join at no extra cost to them. We have hundreds of members whose knowledge is invaluable for helping Pit Bull owners out there. Having access to this has helped hundreds of owners raise happy, healthy Pit Bull Terriers. Q. Your website also offers the sale of equipment for training and caring for American Pit Bull Terriers? Could you tell us a little about this equipment and how it is helpful in the training process? A. I offer mats, beds, toys, backpacks, harnesses, and other equipment like dog boots. These items help in many areas of life with a Pit Bull besides training. Mats can be used for boundary training, beds can be used for this also. If you have a leash puller you might use a backpack to help reduce the pulling behavior by giving the dog a job. Having a comfortable dog helps the dog listen better. During summer and winter, dog boots can help keep their paws from getting frozen or burned on hot asphalt. However you use the items they help in many ways. Q. Any final thoughts you'd care to share about American Pit Bull Terriers or your website? A. I hope that one day Pit Bull owners and Pit Bulls will catch a break. One day I hope people will start to see them as dogs. American Pit Bull Terriers are exceptional creatures and to destroy them is horrible. My web site is all about helping Pit Bull owners preserve the breed through better education. So are pit bulls dangerous? We hope this interview that Jason Mann kindly granted us, helped to answer that. We know from our own experiences with this breed, that they are a very kind and loving dog that has unfortunately been maligned due to a few irresponsible owners. Thanks for setting the record straight Jason!